Yesterday, as I passed the kitchen, I thought for just a second that someone was cooking Indian food. There was a smell of curry that made my stomach growl for something it loves and of which it has been deprived too long. Of course, it wasn't a rich Indian gravy that she was cooking. That intoxicating smell was that of Fiori di Zucca, or squash flowers**. I have eaten them battered and fried many times, but only sauteed (I use the term "sauteed" loosely, as they are thrown in the pan with a healthy cup of extra virgin olive oil) do they exude their intoxicating fragrance. The flavor was similar to the smell and it was the closest this girl's gonna get to an Indian kitchen here in Naples. In many restaurants, you can find them stuffed with ricotta, or various other things, but I prefer to consume them uninterrupted by other flavors. The flowers are delicate, and in my opinion, never hold up well to a heavy filling. Why guild the lily? These 2 preparations will help you understand why simplicity is is the Italian Way. Here they are, fried, and almost fried. I did a little asking around about a typical batter. What most people use is pastetta (multi-purpose yeast batter). I had no luck getting a recipe, but here are the steps. Just take a little water (I would say about a cup), one egg, and a little more than half of a piece of fresh yeast, and a little salt. Let the yeast dissolve in the water and add flour, little by little until it's right. Let it rest for a few minutes. The right consistency is like pancake batter. I tasted the end result of this one and it was delicious--crispy on the outside and a little fluffy underneath. It was perfectly chewy and maintained the integrity of the flower. For those of you who simply must have a recipe, here's one from Essentials of Classic Italian Cooking, by Marcella Hazan. (Great book, by the way. I highly recommend it to anyone who loves Italian cooking.) I haven't made this one, and 2 eggs seem like a lot, but her recipes are always good. Fidati! Beat eggs in a bowl and add dissolved yeast and water and add large pinch of salt. Add flour while shaking it through a strainer and beating the mixture steadily with a fork. Whichever version you choose, once the batter is done, add the flowers (put enough in the bowl with the batter so there's room to stir) to the batter and mix them gently around to coat. You can do them one at a time, but it's much more efficient this way. Slip them, one by one, into oil heated to med-high (the oil should come up a little more than halfway to the flowers). Once they are browned on one side, turn them. You may have to do this in more than one batch. The pastetta is enough for about 30 flowers. Once they're cooked, let them drain on a paper towel. Try one right away, preferably with a good glass of prosecco, please. Heat the oil with the garlic to med until the garlic is fragrant, but not brown. Turn up the heat to med high and add the cleaned flowers (They may crowd at first, but they'll wilt considerably.) Sautee them until they are wilted and tender. Add salt and a little peperoncino. That's it. You will notice that curry smell and flavor and you'll thank me for the recipe. Some of you who are not familiar with eating these flowers may ask, "Tracie, you eat the whole flower?" Yep. It's all edible, completely delicious, and let's you know that summer is just around the corner. **These should be easy to find in the larger cities in America. They should be yellow and orange and have a firm shape. If they have too many brown spots, they must be rejected and never see the inside of your kitchen. If you can't find 'em fresh, you'll just have to come to Italy. Hi Tracie, I don't remember how but it happened to me to start reading your blog!!!!! !And here's my first message to you, maybe those delicious "fiori di zucca" are the key! My name's manuela and I am neapolitan!!!!!!!!!!!! Ok let's stop this boring thing (name, age, town, nationality and so on!). Bye, say hi to gennaro ! Yum. However, I think that instead of searching high and low for squash flowers here in the states I'll follow your suggestion ("...you'll just have to come to Italy...."). Good idea! And I think I'll also see if I can find someone else to try your recipes because whenever I attempt to saute (also a loose term in this case), I usually end up carbonizing instead. You don't happen to have a third version of the recipe for those who specialize in contorni di carbone? manuela--hi to you too :) i'm glad you found me and thanks for commenting. do you live in the states or in naples? Oh thank you for the recipe, I'm definitely going to try it. I'm an avid gardener and a couple years ago an older woman friend of mine from Italy gave me some squash seeds to plant. She told me not to even bother eating the squash, she said they weren't a very good variety, but to eat the flowers. (I'd never heard of this before then.) I did this for a couple of months (I had staggered my planting) over the summer and it was the best summer of my life! I would suggest to people in the states to try and find seeds to grow their own, or to check Whole Foods grocery stores for squash flowers. Yummy! Thanks for the recipes, I shall try them. I sauteed mine before, but the battered and fried sounds yummy, too! yum sauted! I'm getting hungry thinking about it! 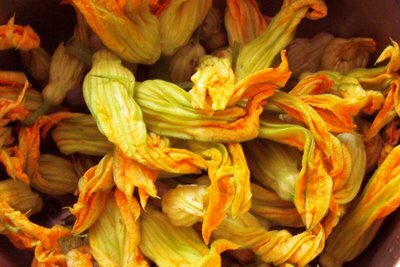 Hi Tracie -- I used to make fried zucchini blossoms from the zucchini I grew in my tiny little backyard garden. Now that I can't eat wheat flour anymore (celiac disease), I thought that would be the end of it...until I just came upon your recipe for "sauteed" flower blossoms! I've been offline for a bit setting up my home network... I've missed you my little cannoli! When I come to Italy you MUST make them for me! I just read "A Thousand Days in Tuscany" (why does everyone love Tuscany so much?). There is a chapter devoted to these fiori di zucca and I was thinking "Im gonna have to try that sometime". Thanks for the recipes. Can not wait to go out and buy some of these babies! I live in naples tracie! Bye and thanks for "welcoming" me!!!! Wow! I've done something like your first recipe a few times (and you're right; zucchini flowers should be TASTED, not covered up with the flavor of any filling) but the second recipe I've never thought of. I can't believe they smell like curry. Delicious! Now, why are there no Indian restaurants in Naples? Aren't there a lot of Indian people there? There are a lot in Milan (people and restaurants). Maybe you should come up here and try them (the restaurants, not the people). I have a lot of squash coming up right now. I could not remember exactly how Nonna did it, but I was going to attempt to make what I called squash flower patties. Nooooooooobody in the south has ever heard of such a thing. Thanks for reminding me. Cynthia Rae - I agree, can't understand why everyone is so caught up with Tuscany, it was the most disappointing part of Italy for us. Now Elba and the Emilia Romagna region - those are worth the trip! I wish I could have a love for food. But to me, it's merely a way for the body to receive nourishment and energy. I've been looking for new recipes today. I think I've found one. I remember these SO well - eating them in Capri in a restaurant under a lemon grove - they were the best. But I am sure they aren't in any grocery stores here - I would remember seeing them! I will give whole foods a try. Or maybe find a zucchini farm, nearby - that was a good idea. I hope they will be as good sans lemon grove. Wow...this sounds absolutely delicious...I want some right now! Why, oh why must you do this to us? And Happy Birthday (belated now) to your Mom...I hope she enjoyed her day!